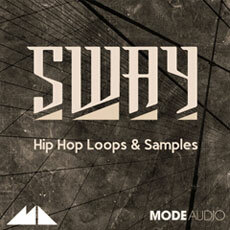 ‘Sway - Hip Hop Loops & Samples’ from ModeAudio delivers a bulging production trunk packed with 270+ files of solid Hip Hop groove! Inspired directly by the darker, freer and wonkier side of Hip Hop, this loop, sample and MIDI collection combines deep Basslines, crunchy Synth Leads, towering Drums and gritty Rhythmic Textures with bittersweet Instrumental Loops, glowing Pads, flowing Chord Progressions and a whole lot more on top! From strutting, dense percussive patterns to stripped-back, rock-steady rhythms, these Hip Hop sounds are dripping with deliciously dark musical energy. The loops range from 86 to 100BPM, enabling you to construct rich Hip Hop beats from the driving all that way to the ultra laid-back! Every single warm, woozy Bass riff, melodic Piano hook, phat Drum groove and beyond is drenched in the same twisted character and is raring to light up your next production. The 120 included loops have been provided in both Acid WAV and REX2 versions, allowing you to stretch and squeeze each sound according to your master tempo whilst retaining maximum sonic quality and clarity. Slicex is just crying out to be paired with any of the REX2 Loops, where you can change the tempo, swap beat slices around and more in seconds - instant groove satisfaction! Alongside the loops, we’ve included 45 warm, organic and deeply characterful Drum Samples, as well as 111 BPM and key-labelled MIDI Loops for your production pleasure. These tools will allow you to get cooking up truly flexible drum beats and patterns in an instant, all with the freedom of being shaped, adjusted, processed and perfected as you see fit. Prepare your music for the penetrating pulse, venomous vibe and mesmerising movement of 270+ Loops, Samples and MIDI Files - loose your head to the delirious beat of ‘Sway - Hip Hop Loops & Samples’!